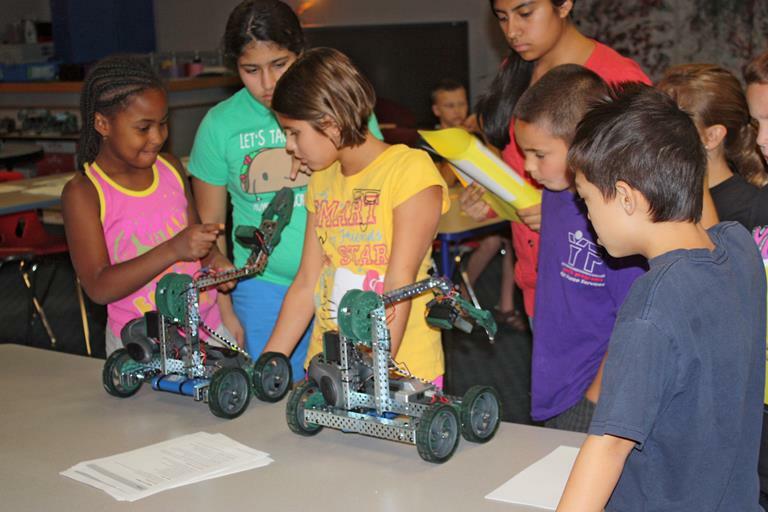 EDWARDS AFB – Youth in the Edwards community are now receiving additional opportunities when it comes to science, technology, engineering and mathematics education, also known as STEM, through the use of robotics. Previously, the only robotics program on base was a FIRST LEGO League at Branch Elementary School. Now, as a result of grants from the National Defense Education Program (NDEP), there will be three additional robotics opportunities on base. Desert Jr. and Sr. High robotics club students will have the opportunity to compete in FIRST Tech Challenge coached by Col. Robert Weaver, 412th Maintenance Group commander. Additionally, they can participate in a Vex robotics program through the Teen Center and younger children can experience FIRST LEGO League, sponsored by the 412th Force Support Squadron, at the Youth Center. 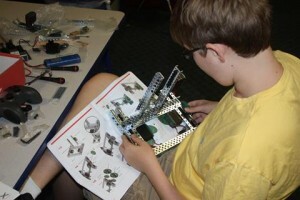 The funding, provided by NDEP, supplies the team’s registration and a game kit, which can include a robot for new teams. Some of the additional funds have been used to purchase additional game kits, tools and foundational resources to ensure that the new programs become self-sustaining. But the project requires more than just funding and resources to last, it will take a community effort. According to 412th Test Wing Science, Technology, Engineering, and Mathematics Outreach Director, Mickey Bowen, the teams will need sponsors, coaches and mentors for success. He added that he has already started to see a “grass roots” effort in promoting and supporting the clubs. “(FIRST) literally is a community, designed and invented by an entrepreneur named Dean Kamen. His whole focus was that he would walk into a school and see sports trophies. He thought, ‘why not put a competition together based on a sports philosophy, but with sustainable career potential,'” said Bowen. He went on to say that schools can still earn trophies through the robotics competitions, but the students are getting a “taste” of career paths that might center around building tools like their robots. For those students who might not be interested in engineering, there are a variety of other jobs that contribute to the “ultimate goal,” creating the robot for competition. For example, the student might be exposed to management, videography, writing, design or formal presentations. The students participating in FIRST Tech Challenge will start with a kit that includes metal framework, screws, gears and other parts to build their robot. The completed Tetrix robot is coupled with the Lego NXT microprocessor that acts as the robots “brain.” In preparation for the competitions, students will create a set of promotional materials including video, essays and poster presentations for their team. In addition to the competition awards, the team may be eligible for awards that applaud their community efforts as well as college scholarships at the national competitions. What they’re learning in the classroom can then be used to show students possible career paths through career “role models.” To achieve this, Bowen encourages parents who work at Edwards to arrange tours for the robotics groups. He has also seen families “pull together” because their child was having difficulty in school but is now “happy” to go to school. “STEM Education Outreach supports student achievement, provides professional development for educators, encourages ethnic and gender diversity, and increases critical thinking skills in every learning environment,” said Christy McCoy, school liaison officer. Bowen has been working towards increasing STEM programs at Edwards for six years. 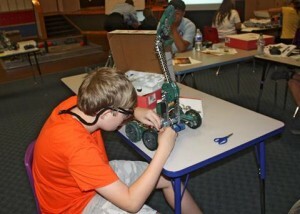 His ultimate goal is to have Edwards host the first VEX Robotics Competition, within the Antelope Valley. To volunteer with FIRST Tech Challenge at Desert Jr. and Sr. High, contact Coach Weaver at robby.weaver@yahoo.com.